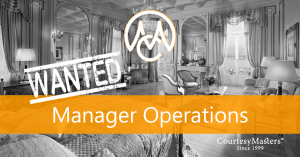 For a beach resort at Aruba we have a new opening for an Operations Manager (ico Rooms) who will mainly be focussing on Housekeeping, Maintenance, Front of House and Quality control. So if you prefer Aruba instead of Jamaica or Bermuda….”come on pretty mama!!”. Due to confidentiality we unfortunately cannot publish about 70% of our recruitment assignments.